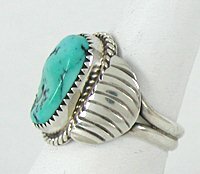 I want to get a ring like I saw in Thunderheart, the movie with Val Kilmer. Can you help? There were actually 4 rings prominently featured in Thunderheart. Three were worn by Ted Thin Elk who played Grandpa Sam Reaches, the elder who lived in the remote trailer house. 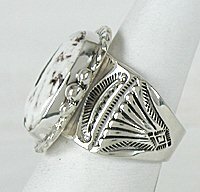 His wore two Navajo rings. One was a turquoise stone and one was a white buffalo stone. He also wore a Zuni ring made by Effie Calavaza that had coral and turquoise and a snake winding between the stones. Here are examples of the 3 rings Ted Thin Elk wore. 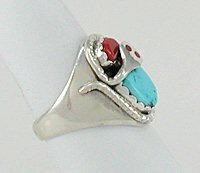 Graham Greene, who played the tribal police officer Walter Crow Horse, wore a Navajo ring with a rectangular turquoise stone like these.